In the photos from the last post, you may have noticed both a bright glow on the horizon, and a very pinkish light illuminating the yukimarimos. The sun is very clearly returning, and the lightshow of sunrise has begin. Last week - two full weeks before sunrise - the sky was already aglow with colors. What started in mid-August as nothing more than a deep blue tint to the black of night had evolved into a fire painting the horizon. These shots are all from last week, when we had our clearest weather in months, affording an unobstructed view of the horizon. 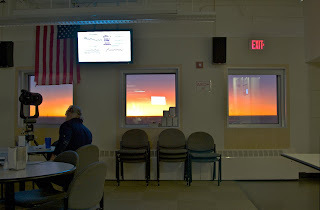 Having been deprived of light and color for so long, even the faintest glow can catch our attention: everyone on station was more or less flabbergasted by the colors suddenly pouring over our world. Two weeks after sunset, I don't recall any colors at all. Two weeks before sunrise, I could swear the sky was burning. Following our winterover photo on Tuesday, I spent the afternoon on my yukimarimo hunt, but that far from finished my day's photography. On entering the galley for dinner, you couldn't help but be shocked by the bright orange light spilling through the windows. Even with all the windows on station heavily tinted to keep out the blinding light of midsummer, the view from the galley was spectacular. The real horizon was even more stunning, and unfortunately well beyond my capabilities to do justice in a photograph. Since that evening, we've had mostly overcast weather, and with the exception of occasional glimpses through the clouds, have missed the glow on the horizon. 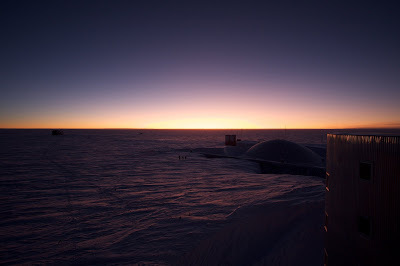 It's still a little over a week until sunrise, but it's getting hard to imagine how bright it will actually be outside. Having gone six months without sun, our eyes are not well equipped for daylight. The next week will certainly be an interesting one - I have a hunch I'll be back to my trusty tinted goggles very soon. It looks like our sunsets. Stunning images.